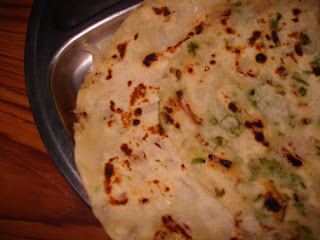 Biyam Rotti or Rotis made from Rice flour is very common in rural parts of India. 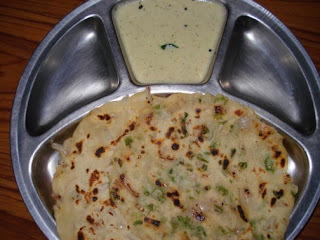 Amma makes many of these rottas from flours like maize, Ragi but the one from Rice is the simplest and also very tasty. Since we had this big box of rice flour ready, we have been having this for our breakfast. Since its made from rice, we have no problem convincing anybody, infact my daughter like it even though this was her first time. Take a mixing bowl with rice flour, add salt and mix well. Then slowly add water to form a pliable dough. If you are not able to form a ball of the mixture, add wheat flour. The water can be warm water but its not required if the flour is wet or finely pound. Mix finely chopped onions, finely chopped Chillies and Coriander leaves the flour and mix well. Take a moist cloth and spread on the back of a plate. Divide the dough into equal balls. Dab oil to your fingers and spread it evenly on the wet cloth. Plastic sheet can also be used. Heat a pan to fry these. Spread oil to ensure this does not stick. Then carefully remove the rolled out rotta to the hot pan. cook on both sides by add oil. Remove once its well cooked. This can be eaten as such or can be served with Ground nut chutney. Sending this to Jihva For Ingredients - Rice hosted by Sharmi at Neivedyam.